To share with others the "new-to-you" books found during the course of the week, either on the web (blogs or otherwise), through recommendations (newspaper, family, friends, etc. ), or by browsing (in the library or the bookstore). These are books that you either want to add to you TBR pile, or that just sounded interesting, unique, groovy, etc. * Write a post about you finds. 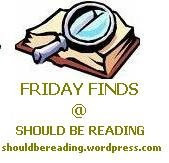 * Share the link in a comment at Should Be Reading’s current “Friday Finds” post.